Upon completion of the course, students will be familiar with the procedures and equipment necessary to operate in different types of airspace, as well as how to plan a successful flight through the application of advanced flight planning techniques. Review the course schedule for a complete list of available worldwide open enrollment training classes. To learn more, download the International Flight Planning for Dispatchers printer friendly document. 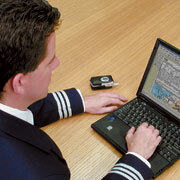 For pilot training, view the International Flight Operations for Pilots training course.